Yes, the summer is technically over, but if there’s one thing geologists excel at, it’s being out doors in all weathers. Earth Science Week 2013 is upon us, and to celebrate we want as many people as possible to explore the geology in their local area – whether you live in a city or the countryside! 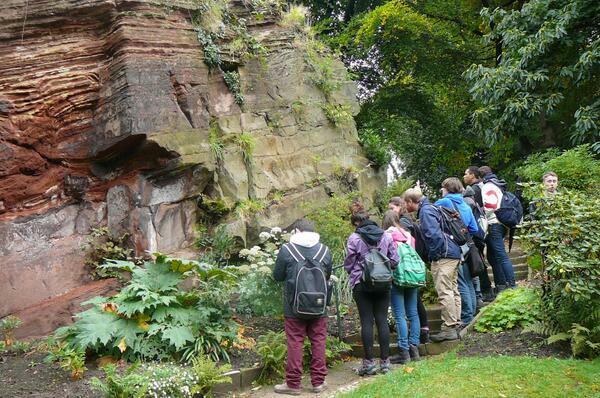 Join us on one of the guided geowalks taking place this week, or take yourself on your own geowalk using our list of all the freely available, downloadable geology walks we can find. Download a walk in your area, or explore on your own. Either way, we’d love to see some pictures of geology where you are – tweet us @geolsoc using #greatgeowalk or email us on ESWUK@geolsoc.org.uk and we’ll share them with the world! We’ll also be uploading geowalk ideas on our blog all week, so keep checking back for more. Photos are being continuously uploaded to our Flickr page during the week, so hop on over if you’re in need of inspiration. And for added incentive, we’re holding a photography competition, with a first prize of £100, for photographs on the theme of ‘Geology on your doorstep’. If you know of a walk we should include in our list, or any that are being held during Earth Science Week, let us know in the comments below, or email us on ESWUK@geolsoc.org.uk! Tags: communication, earth science week, education, environment, geography, geology, geowalk, maps, outreach. Bookmark the permalink.